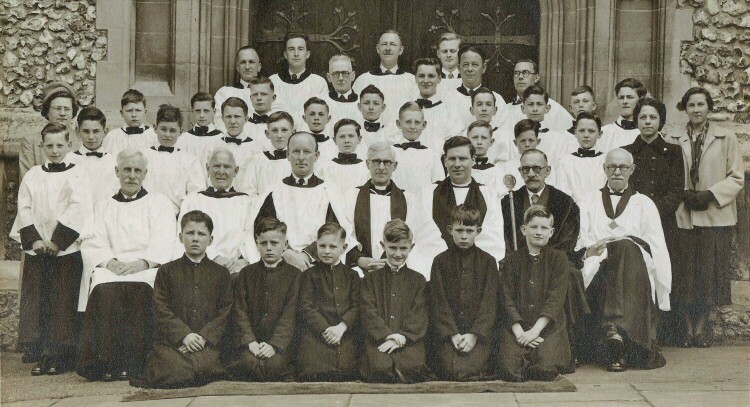 Parish of Leatherhead - Parish Church Choir 1952? * Rosalind Corteen writes: Mr Arnold was a Lay Reader (as it was then) in the parish, and his wife was called Nellie, and they lived in either Highlands Road or Highlands Avenue. It is their son [Pilot Officer Edward Rolfe Arnold RAF(VR), Observer, 35 Squadron RAF, kia 10 March 1941] who is buried in the churchyard and who was killed by 'friendly fire' in the Second World War. I remember that Mr Arnold used to take the services for the patients at Leatherhead Hospital at one time. Philip Goacher writes 3 Nov 06: Mr Locket was an accomplished and much liked organist and choirmaster known to the boys as 'Lucy' Locket. I'm pretty sure that it was taken in 1952, it certainly wasn't any later as I would then have been wearing my head chorister's medal. I still have the gift Mr Taylor gave me for my 21st birthday. Kath Collis was a very good friend and she, my father and I used to practice our singing together. Kath occasionally played the organ in Church. She and I were members of the Leatherhead Choral Society and she was also a member of the Goldsmiths Choir in London. The Rivington family lived in St Nicholas Hill. Mr Taylor lived in the Crescent. Brenda Strudwick is now Mrs Houston and she and Geoff live in Fetcham. I have very many happy memeories of my 30-year association with the Parish Church.